Earlier last fall, Bob and I set off for a three-day visit to Algonquin Provincial Park in Ontario. We were on a mission to find and photograph a Bull Moose. Given the time of year, the odds were pretty good that we might come across one. 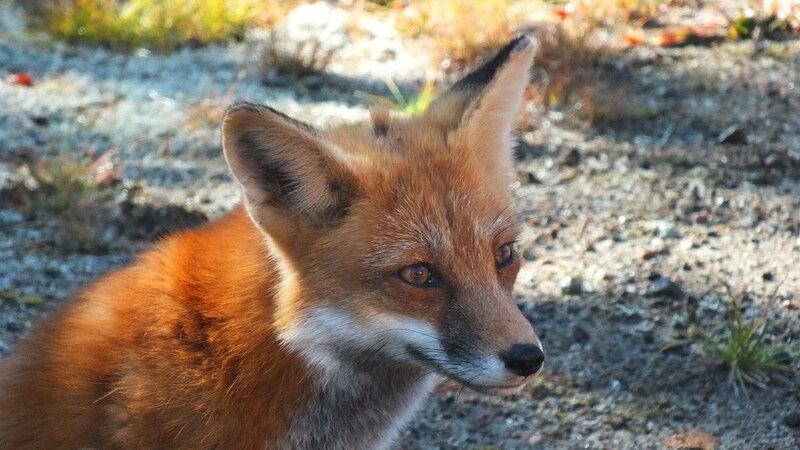 Instead, we were rewarded with the opportunity to observe and photograph not one, but two, Red Foxes (Vulpes vulpes). I was ecstatic! We had picked a particularly nice stretch of weather for our getaway, and the timing was perfect for taking in the colourful fall foliage. 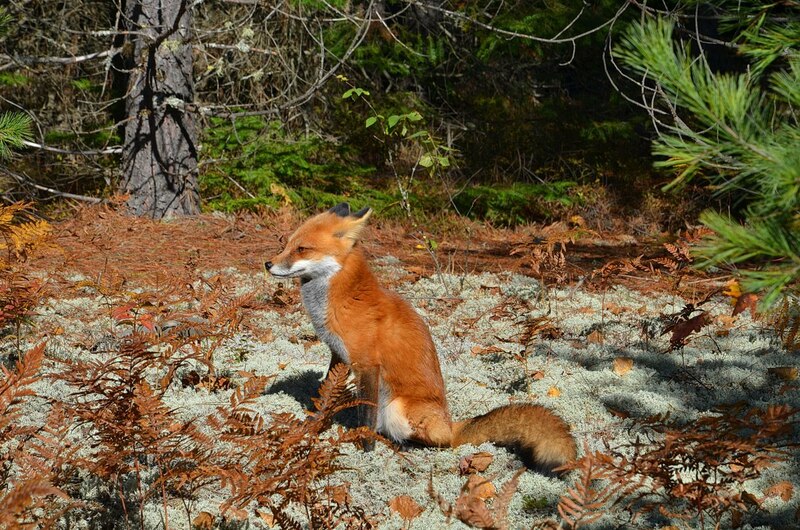 We were cruising along enjoying the spectacular autumn colours when we first spotted the Red Fox. It appeared a little shy as it held back under the cover of some low-hanging pine tree branches . Red Foxes have a reputation for being bold, cunning and deceitful, but in actual fact, they are shy, secretive and have a nervous disposition. The Fox was very cautious and yet did not seem to be afraid of people. 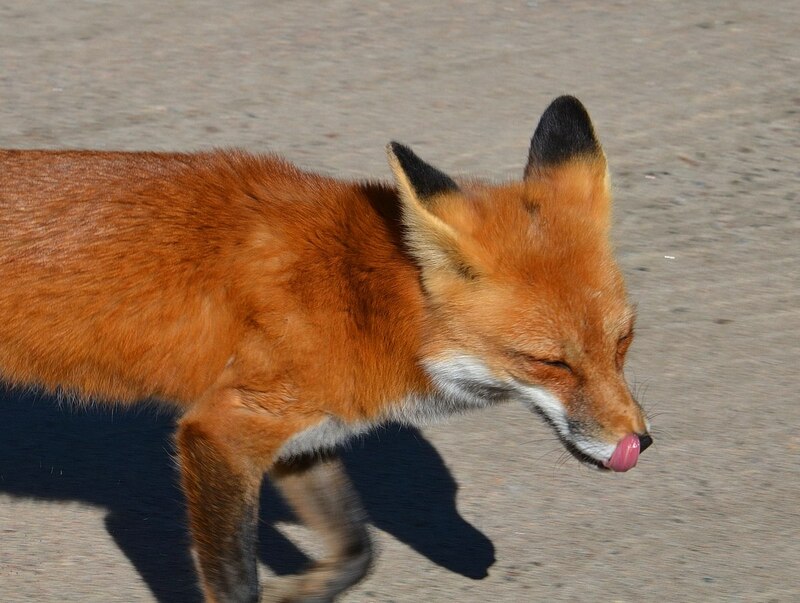 We learned that, during harsh winter months, Park personnel have supplemented this Fox’s diet to prevent starvation, and so, it has become somewhat familiar with people. 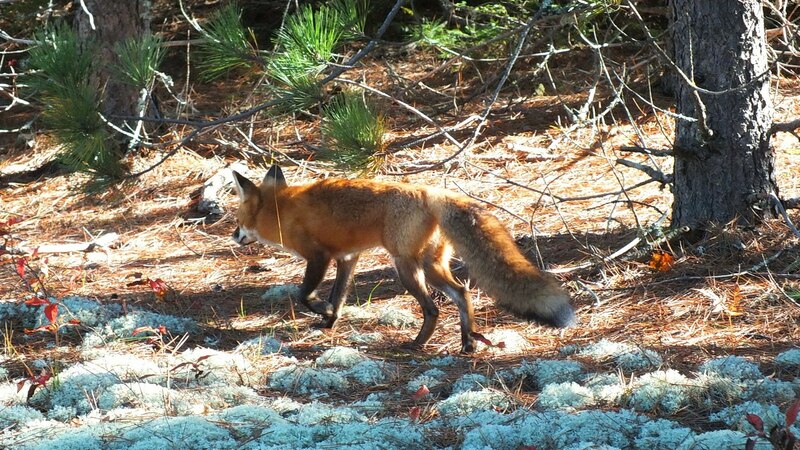 Feeding wild animals in Algonquin Park, including foxes, is strictly prohibited by members of the public, so although this Red Fox came looking for handouts, none were dispensed. 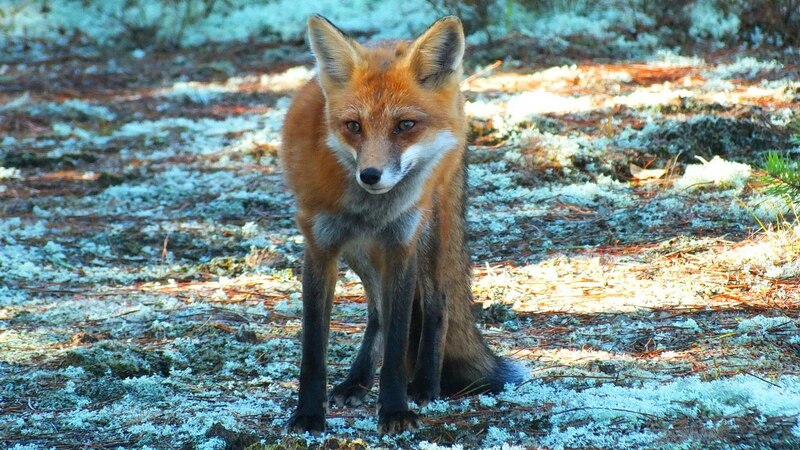 Red Foxes are widely distributed across all provinces and territories in Canada from the Arctic Circle south through the United States and Central America, and they inhabit Europe, Asia, North Africa and Australia. This small dog-like mammal has a sharp-pointed face, prominent black-tipped ears, a faint black muzzle with white upper lips, a coat of lustrous fur and a huge bushy tail. In fact, the tail makes up one-third of a fox’s overall length. Given the name Red Fox, one might assume that all members of this species are red, but there are three main colour variations or colour morphs, red, silver/black and a cross phase. Within a litter, not all pups may have the same coloured fur, although red is the most common colour of a red fox. Even at that, there are different shades of red ranging from pale yellowish-red to orangish-red on the upperparts while the paws are black, the throat and underparts are white and the long, bushy tail has a white tip. As Bob and I photographed the Red Fox, other people in the area were hand-feeding the numerous Canada Jays or Grey Jays that flitted from Pine Tree to Pine Tree. Smelling the nuts and seeds, the Red Fox was encouraged to come ever closer. 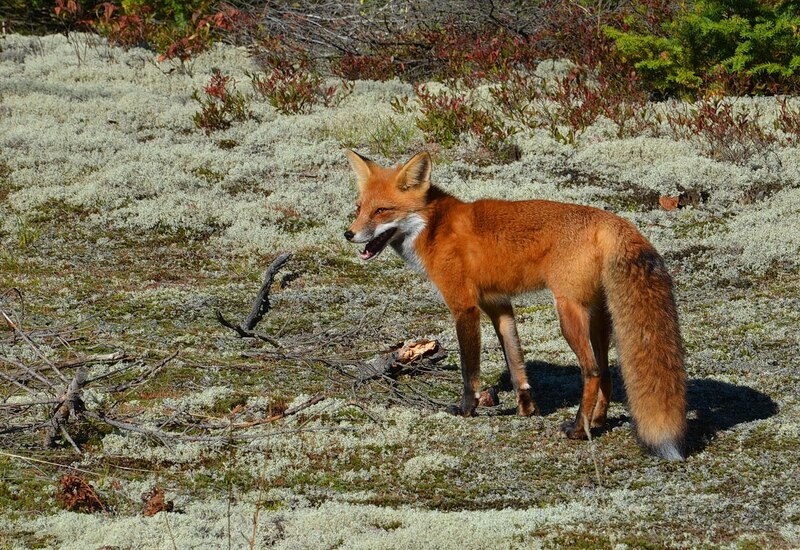 With such an acute sense of smell, the Red Fox was able to locate pieces of bird food in the sand and lichen, and obviously found them quite tasty. For the most part, Red Foxes eat small rodents such as voles, chipmunks, mice, squirrels and rabbits, but their diet does vary according to the season. In winter, their diet consists of a higher percentage of small mammals, whereas in the summer months, they consume a wider variety of foods including crickets, earthworms, crayfish, grasshoppers and a selection of fruits. Their wide distribution throughout the northern hemisphere can partly be attributed to their diverse diet. 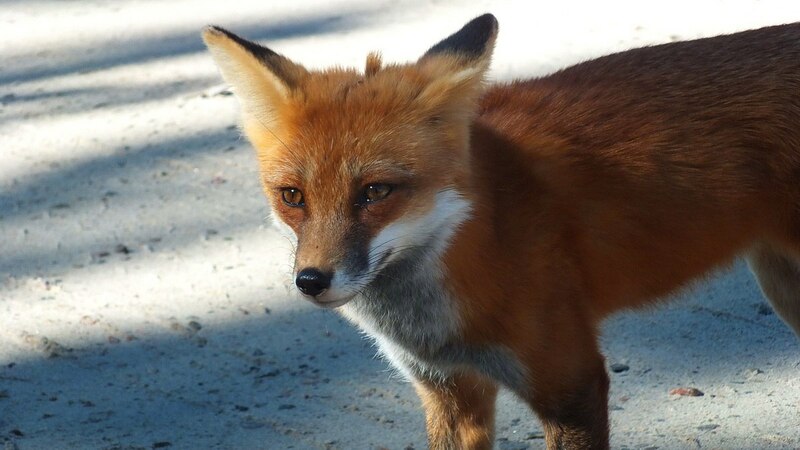 Red Foxes do most of their hunting between twilight and dawn, during which time they will traverse their home range. That represents a lot of traveling in one night because a fox’s home range can be anywhere from 4-8 square kilometres (1.5-3 sq. mi.) around their den site. 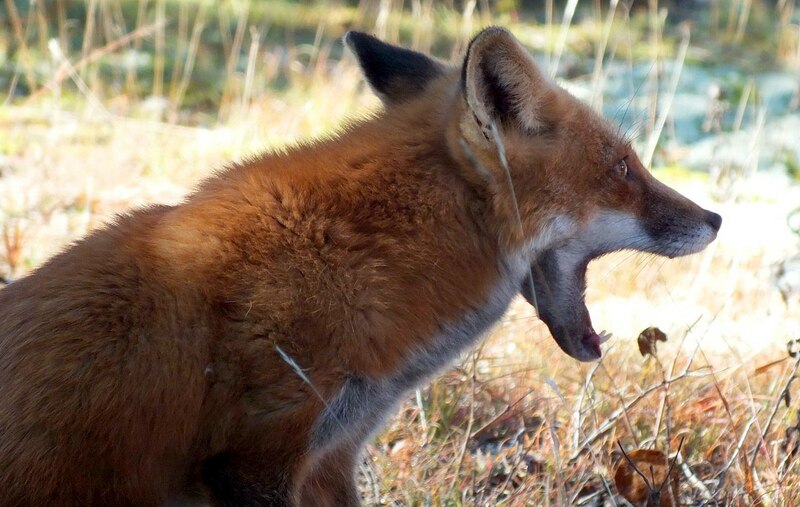 Judging by this fox’s wide yawn, it is either dreadfully bored or thoroughly worn out from its nighttime foray. It is a fox’s acute senses that make it an excellent nocturnal predator. 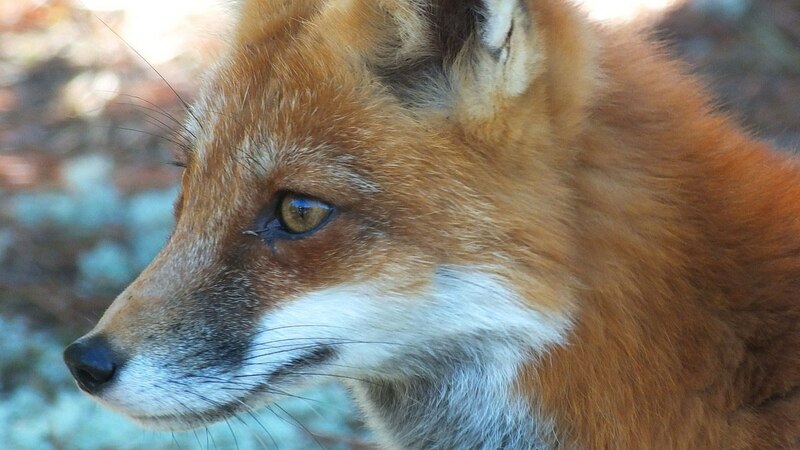 Interestingly, Red Foxes have binocular vision that mostly reacts to movement, and the eyes are specially adapted to work well in low light. In combination with their keen sense of hearing that includes the ability to detect low-frequency sounds very well, a skill not shared by other mammals, Red Foxes are expert at finding small rodents even below ground or under snow. A Fox easily maneuvers its large, erect ears to pinpoint the faint rustling noises of rodents, zeroes in on the location with its eyes and ears, and then pounces. 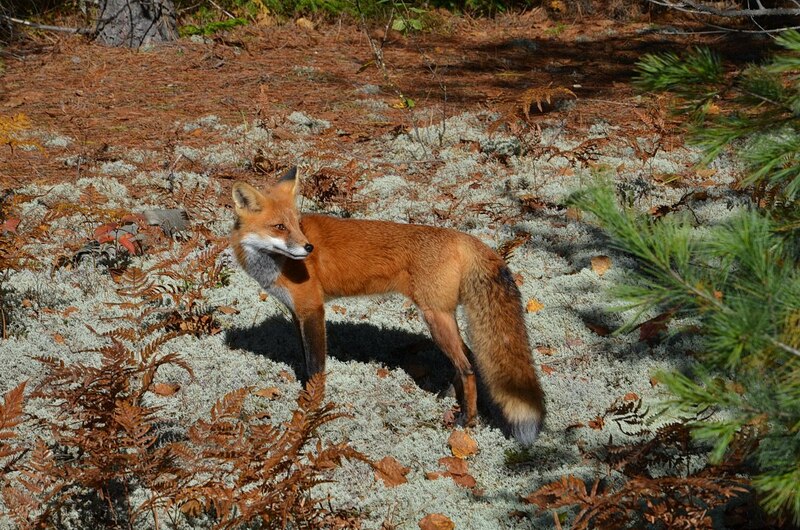 It just so happens that the first Red Fox that Bob and I photographed was the female or vixen from a known pair of Red Foxes, and we observed her one morning on our fall visit to Algonquin Park. The following day, Bob and I were on our way to a trailhead for a morning hike when we came across the male half of the pair, known as the dog. The distinction was made possible by the fact that the male limps and is slightly larger than his mate. On both occasions, only one fox was seen. Getting back to the manner in which Red Foxes hunt, it is important to note that these mammals have longer legs and smaller stomachs than other canid species, which are mammals of the dog family that includes grey wolves, dogs and coyotes. 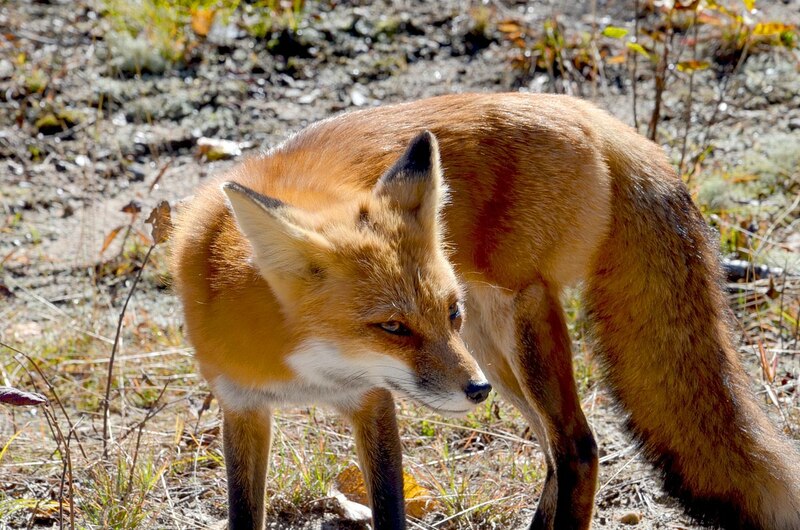 This means that Red Foxes can run faster, almost 48 kilometres/hour (30 mi./hr. ), but must eat more frequently. As Bob and I observed the male, it became evident that he was much more wary than the female. Being very lightly built, Red Foxes are extremely nimble on their feet, and this male proved it when he expertly navigated through dense bush and hopped fallen logs. He essentially disappeared into the underbrush time and time again. It would have been nice to see the male and female Foxes simultaneously since they are a mated pair that has been together for many years. It was too late in the season to see the kits or pups, those having been born sometime between March and May. While Red Foxes pair for life, they are primarily solitary animals; they do not form packs and they hunt by themselves. It is only for breeding and denning that they remain together as a family. This handsome dog fox and his sleek vixen have successfully raised many litters. I love how his rich, rusty-coloured coat matches the ripe fern fronds. With patience, Bob and I waited for the dog fox to return to open ground where we had ample opportunity to observe its behaviour and snap a few photos. 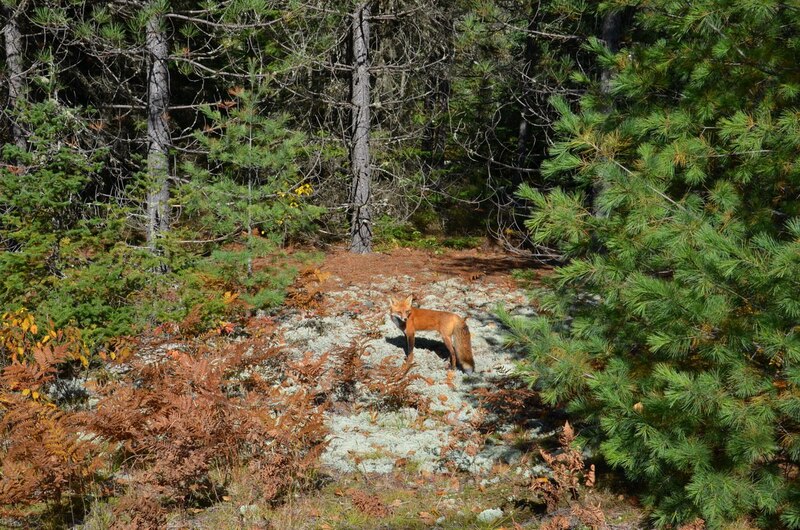 The habitat was perfect for the Red Foxes, which prefer to live on the edge of a forested area. 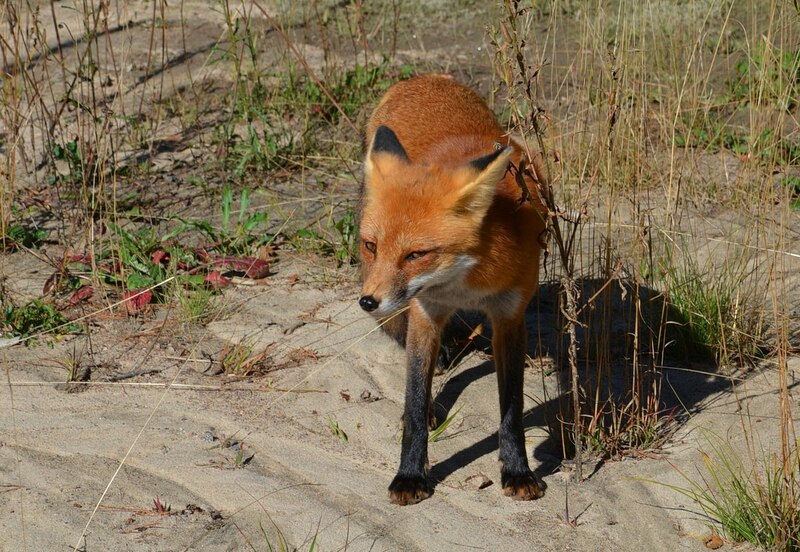 Sandy soil in that area guarantees ease of digging a den, but after breeding and denning season, Red Foxes choose to live in the open where there is dense vegetation. Only during a streak of wet, cold weather are they apt to return to one of their burrows at other times of the year. Otherwise, when sleeping out in the fresh air, it is a Red Fox’s long, wide tail that supplies warmth when it is wrapped around the fox’s curled, prone body. 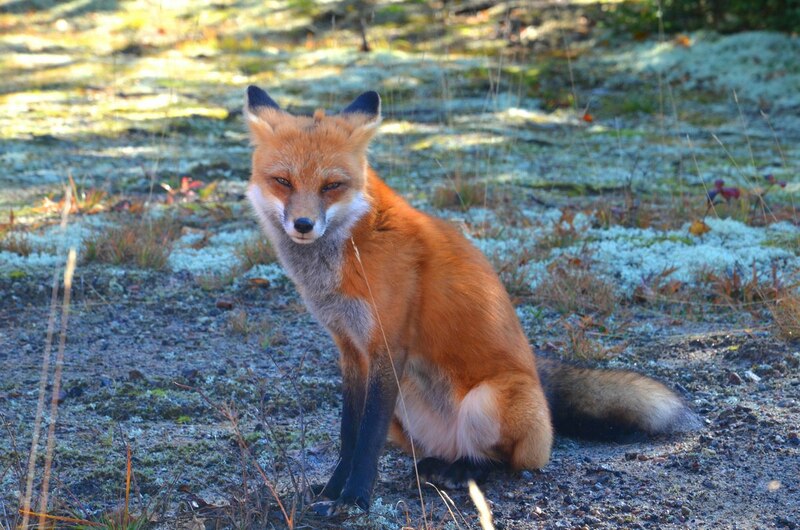 The body language of a Red Fox can tell you a lot about what it is thinking. You just need to observe the movements of the ears, tail and overall posture. 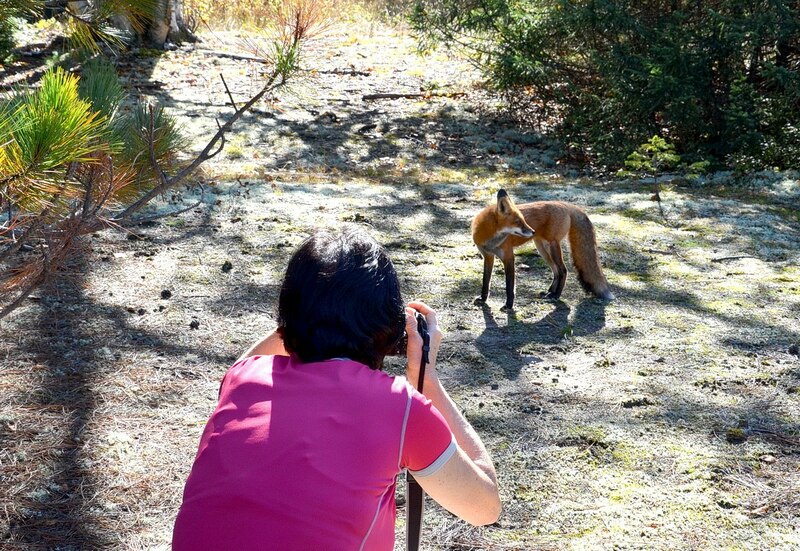 When other people showed up behind us, the dog fox was intrigued. We recognized the telltale signs when the fox began to rotate and flick its ears while at the same time doing a lot of sniffing. If, on the other hand, a Red Fox is afraid, it will arch its back, curve its body, crouch, lash its tail and present a facial expression reminiscent of grinning while at the same time pointing its ears backwards and laying them flat against its head. 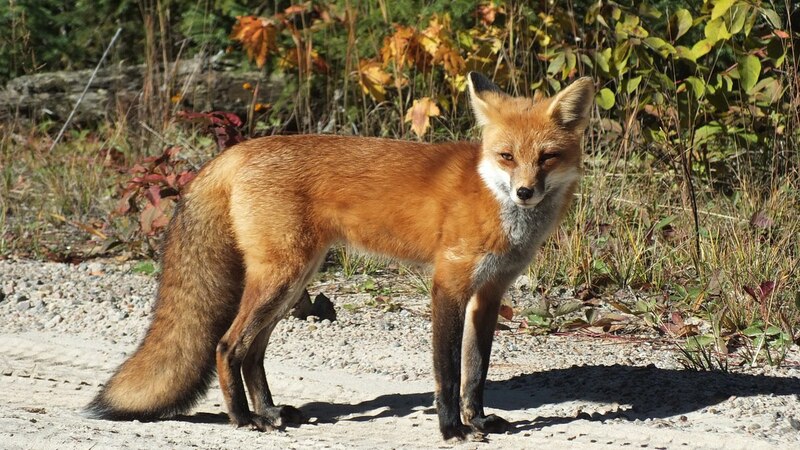 When expressing submission to a dominant animal, the same body posture is assumed minus the arched back and curved body, and at such time, a Red Fox will render itself vulnerable by lifting its muzzle in greeting. There is a little cat in every fox. An adult fox’s eyes are yellow, and just like a cat’s eyes, they have vertically-slit pupils that open very wide to gather light. That is why they have excellent nighttime vision, but there are other reasons why a Red Fox is more like a cat than a dog. A fox’s tongue is coarse and raspy like a cat’s tongue owing to backward-facing barbs called papillae that make it easier to lap water and groom their fur. The whiskers on a fox’s muzzle are longer and finer than a dog’s making a fox again more like a cat. As well, both cats and foxes have whiskers at their wrists that act as feelers to improve aim when pouncing and to facilitate maneuvering in the dark. A little-known fact is that Red Foxes can climb very well and make use of that skill to scale trees in search of squirrels, eggs and fruit and to stalk birds. 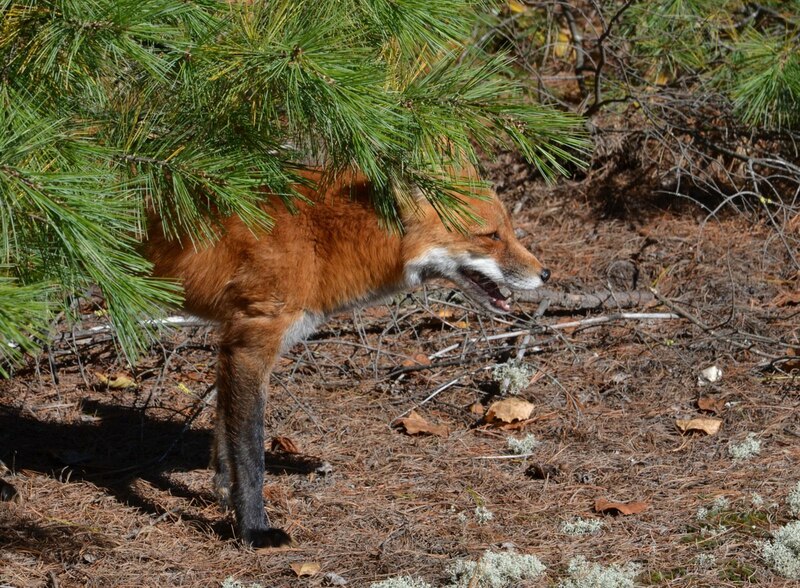 You should not be surprised if one day you find a Red Fox sleeping in a tree. Red Foxes have superb balance and move with cat-like grace owing to their light frames and slender legs making them formidable hunters that stalk prey and move in for the kill with a pounce equivalent to small feline counterparts. It is likely that foxes share so many traits with cats because they hunt the same type of prey. Considering that a Red Fox usually sleeps between nine and ten hours during the day, Bob and I were fortunate to have seen one, let alone two of them within two days. We were so happy because on one of our evening drives through the Park, we had seen no less than three foxes, but they were like phantoms…no sooner spotted but what they disappeared into the shadows. And just for the record, we never did meet up with a bull moose on that trip to Algonquin. Wow I’m surprised how close you were able to get to the foxes. We were surprised, too! 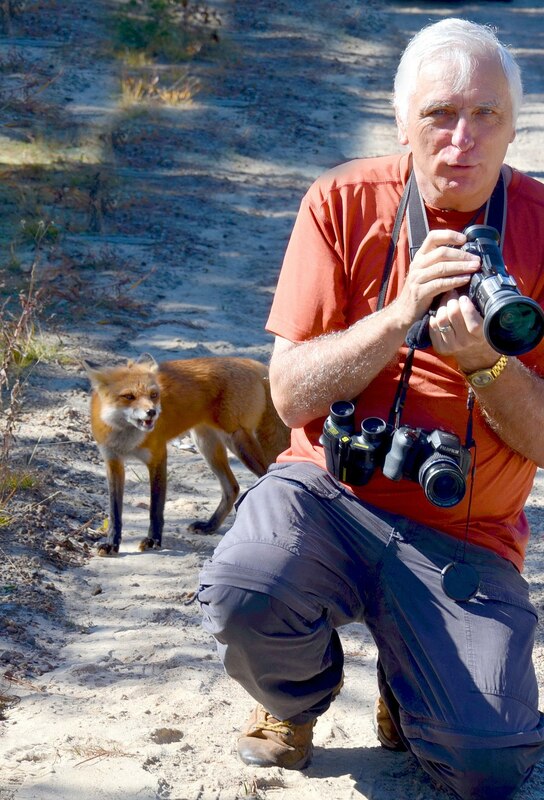 Actually, if you just stand and wait, the foxes will almost walk right up to you. They are such attractive animals, and can throw you the most endearing looks, but they can dart away at a moment’s notice.